Home On the Water Canoe & Kayak These Folding Kayaks are the Size of a Backpack! Portability is the most important aspect of an adventurer’s life, anywhere from electronics to camping equipment. That’s where a kayak that folds to the size of a backpack comes in to play. Creating a world for more accessible and easy-to-use products is at the forefront of invention, especially for the outdoors lifestyle. When you think of origami, what comes to mind? A swan, or maybe a cat, or even a flower. But would you ever think of an origami kayak? This easy-to-fold kayak is perfect for those without a vehicle to bring their boats to the water. It folds into the perfect lightweight backpack and comes with two straps to carry it just like so. There are a few models to choose from, each expanding upon the notion that big and bulky doesn’t mean less accessible. One model, the Oru kayak, weighs about 30 pounds and can really take a beating. Just like any normal kayak, it’s made from a UV treated polypropylene so it can withstand rocks and rolls. There’s also the low number of parts for construction, which is a plus for beginners. Another model is the Hypar, which brings almost the same design as the Oru, but it’s only 18 pounds. This isn’t on the market quite yet, but for good reason. The design is turning into a more versatile water machine with the ability to convert into a kayak, sailboat, or power boat. Definitely be on the lookout. 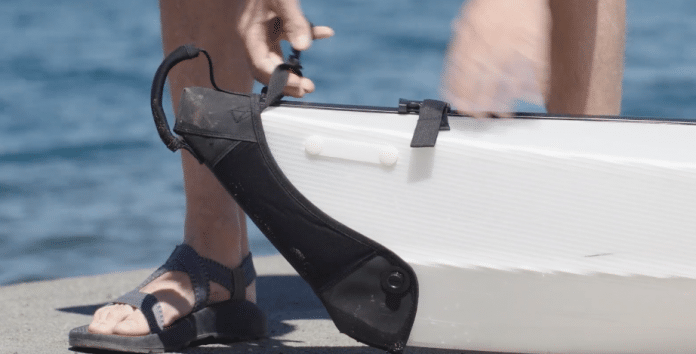 Other folding kayaks to look out for are from companies like Long Haul, which include transparent kayaks like the Napali, and the Pakayak, which folds itself into a Russian doll-like pack for easy carry. The more portable the kayak, the more experiences there are to have. With the ease of traveling on foot comes the ease of traveling with your kayak. It’s as simple as that!